WILMINGTON – Olivia Veidt continued to dominate in the circle for the Wilmington High School team. 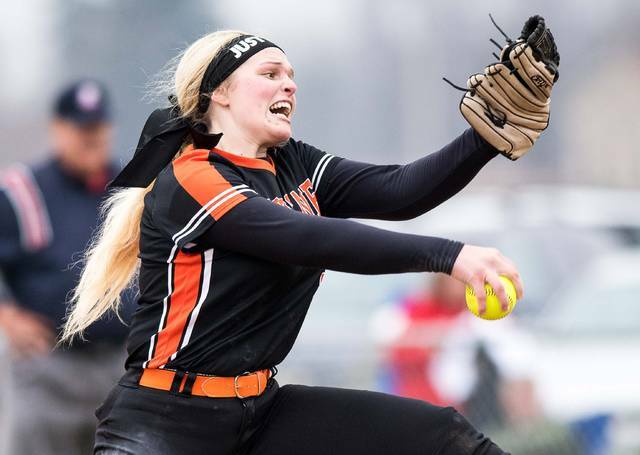 But rather than defeating the opposition with a bunch of strikeouts, Veidt and the Lady Hurricane are perfectly fine with letting the defense do the job. On Friday, Wilmington blanked New Richmond 9-0 as Veidt ran her scoreless streak to 12 innings, coach Brian Spurlock said. Veidt also blanked Talawanda in a five-inning win on Wednesday. “Our defense, led by Harlie Bickett’s exceptional play, just keeps getting the job done day in and day out,” Spurlock said. Bickett had five assists and a put-out on defense for the Lady Hurricane. Alix South led the offense with three hits. Emily Self and Kendra McKenna had two hits and two RBI each. Madi Flint had two hits and scored a couple of runs. Wilmington is 5-2 overall and 2-1 in the American Division. New Richmond is 5-6 overall and 1-2 in the conference.